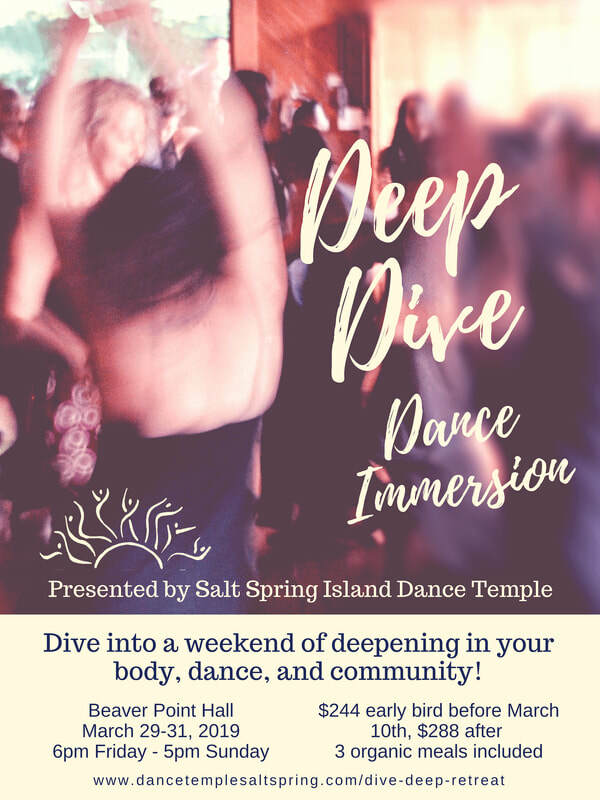 Dive into a weekend of deepening in your body, dance, and community on Salt Spring Island! What is it that you are springing into? In this dance immersion, you will have the opportunity to explore what is budding in your life. What new flowers are beginning their journey into blossom? What new bird songs are wanting to be sung through you? What is thawing out within you and giving way to new life? Experience an expansive range of dance modalities, somatic movement practices, the joy of being in community, and sacred space to set your intentions and plant your seeds for the seasons ahead! 5 conscious dance facilitators, the core keepers of Dance Temple Salt Spring, are coming together to co-weave this weekend: Cedar Mathias, Naomi Jason, Shauna Devlin, Cat Love, and Lila Spencer. Combined, they offer several decades of experience both as dancers, teachers, event hosts/producers, and choreographers in many different modalities of dance including modern dance, 5 Rhythms, Inner Journeys Dance, Kundalini Dance, Somasource and more. Email dancetempledeepdive@gmail.com to pay and for more information. The weekend will be hosted by Cedar Mathias, Naomi Jason, Shauna Devlin, Cat Love, and Lila Specer who combined offer many decades of experience both as dancers, teachers, hosts, and choreographers in many different modalities of dance including modern dance, 5 Rhythms, Inner Journeys Dance, Kundalini Dance, Somasource and more. We will provide 3 nourishing meals plus coffee/tea and snacks. All organic and vegetarian, local where possible, and delicious. We will have gluten free and dairy free options available. Please let us know if you have any other food sensitivities. Please inquire if you are from out of town and we can facilitate finding you a warm place to sleep. There will likely be an additional cost of 15$ per night to be paid to the hosts. A list of B&Bs can also be given to you. Change of clothes, warm clothes, blanket, flashlight, pen, journal, towel. Please fill the form on the registration page. ​If you are in need of financial assistance, please email or speak with us. We are excited to dance with you! !